So you want to go hiking in South Lake Tahoe. You checked in to your room or suite, or even perhaps the five bedroom deluxe vacation cabin, at the 3 Peaks Resort and Beach Club, unpacked your bags, and have partaken of the mandatory meandering about the town. You walked the two short blocks to our private beach, took off your shoes, and walked barefoot in the sand. You walked the two blocks to the base of the Heavenly Gondola, checked out the Heavenly Village shops, perhaps wandered the two or three blocks to one of the casinos just over the line in Stateline, Nevada. But none of those are the real purpose of your trip. You're here to get away from all that. 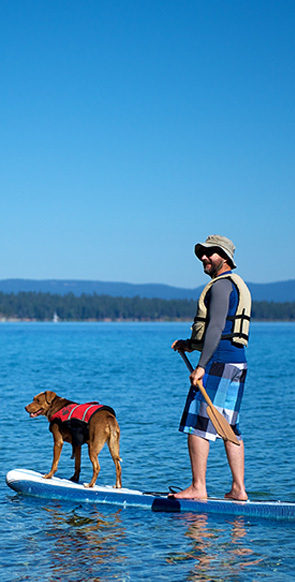 You're here to experience the wonderful wilds of the South Shore of Lake Tahoe. So, what's available in the way of hiking trails around here? There are seven highly popular and relatively well traveled hiking trails in the South Lake Tahoe area you will want to know about and possibly explore. As is customary we'll begin with the easy, walking trails and work up through the more strenuous. The most difficult trails are covered in another article: Advanced Hiking in South Lake Tahoe. There are three well-known easy walking trails: Moraine, Angora Lakes, and Lake of the Sky. All three of these trails are relatively flat; the Lake of the Sky Trail at the Lake Tahoe Visitor's Center is the shortest at 1/3 mile one way. The Angora Lakes Trail is about 1/2 mile. Once at the lakes you can swim or do some fishing. As the lakes are quite popular you will want to get there early to "reserve" a spot if you intend to spend the day. The Moraine Trail is a beautiful nature walk of about a mile (one way) through a forest and along the shoreline of Fallen Leaf Lake. A moderately difficult, and much longer, hiking trail is Echo Lakes. This trail is great if you don't know exactly how hard you want to work for your pleasure! A short 2-1/2 mile hike brings you to the northwest corner of Upper Echo Lake. Other lakes, requiring longer treks, include Tamarack Lake (about 1-1/2 miles further), Lucille and Margery lakes, and Lake of the Woods (different trails each about 1 mile beyond Tamarack Lake), and Aloha Lake (about a mile from lake of the Woods or Margery Lake). So you can walk until you get "half tired," then turn around and start back. Hike as far as you like and enjoy great lake and forest scenery regardless of how deep you penetrate the wilderness. Wilderness Permits are required for most of these trails and are usually available at each trailhead. Directions to each trailhead are given at http://www.tahoesbest.com/Hiking/trailsbyregion.htm#South. Remember to bring plenty of water and, especially for the longer hikes, a light jacket or windbreaker, as the weather can change suddenly from bright and sunny to overcast and cold. Dogs, where allowed, must always be on a leash.